At one stage Magpie-larks were grouped together with White-winged Choughs and Apostlebirds as the "mud nest builders" on the basis of their superficially similar bowl-shaped nests built largely of mud. Recent research has revealed that Magpie-larks (and the closely related Torrent Lark in New Guinea) are in fact simply large terrestrial flycatchers. 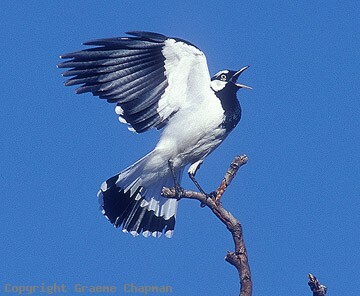 The Magpie-lark is one of our most familiar common birds - it occurs over most of Australia and in all of our capital cities (except Hobart) where it is variously known as Peewee, Peewit, Mudlark or Murray Magpie. The name Peewee derives from the loud distinctive call. Very often a pair will stand on a rooftop or telephone pole and loudly proclaim their territory. The song is sung alternately by each bird (called antiphonal singing) and each "peewee" phrase is accompanied by lifting and opening the wings, known as "flag display". Their liking for feeding along the edges of or in shallow water betrays their close relationship to the Torrent Lark of New Guinea which, as its name suggests, frequents small flowing streams. Adult Peewees live as pairs in permanent territories which they strongly defend against intruders. Our local male (Mr. Peewee) is at least ten years old and every morning he comes to our back door and sings loudly to prompt us to feed him his morning titbit. She used to be equally as trusting but ever since we had to catch her to remove some fine nylon fibre that had entangled her left foot, she has been rather wary. Their latest offspring (young Mr Peewee) left the nest on 7th April and now (May 25th) has almost completed his first moult from juvenile into immature male plumage. His eye colour is still rather dull, not the clear bright cream of an adult and his still juvenile efforts when practising song are sometimes comical. (listen on sound page) Nestling Peewees remain in the nest for about three weeks, so that makes him roughly 10 weeks old. About a week ago, our young Peewee stopped pleading from his parents - it won't be too long before he leaves for good to join a flock somewhere in the district of newly independent and non-breeding birds. Such flocks usually inhabit more open areas such as parks and fields, away from breeding territories. In northern Australia, these flocks sometimes number in the hundreds when birds move to greener coastal regions in the dry season. 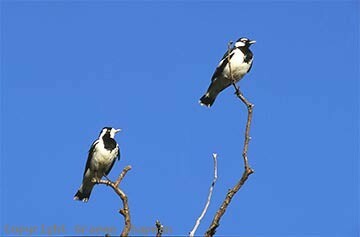 415201 ... Magpie-lark - female (left) and male (right). 415203 ... Male singing to advertise territory - known as "flag Display"
415204 ... 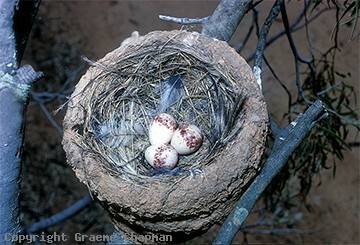 The nest, made largely of fibrous material cemented with mud, is usually feather lined. 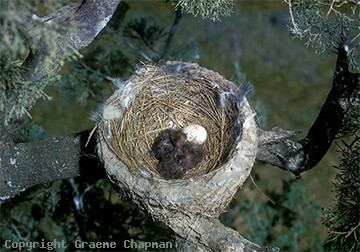 415205 ... Peewees use a lot more fibre in their nests than either Apostlebirds or White-winged Choughs.